This a movie review of TETSUO: THE IRON MAN. Anyone anticipating a Japanese Tony Stark should look elsewhere. 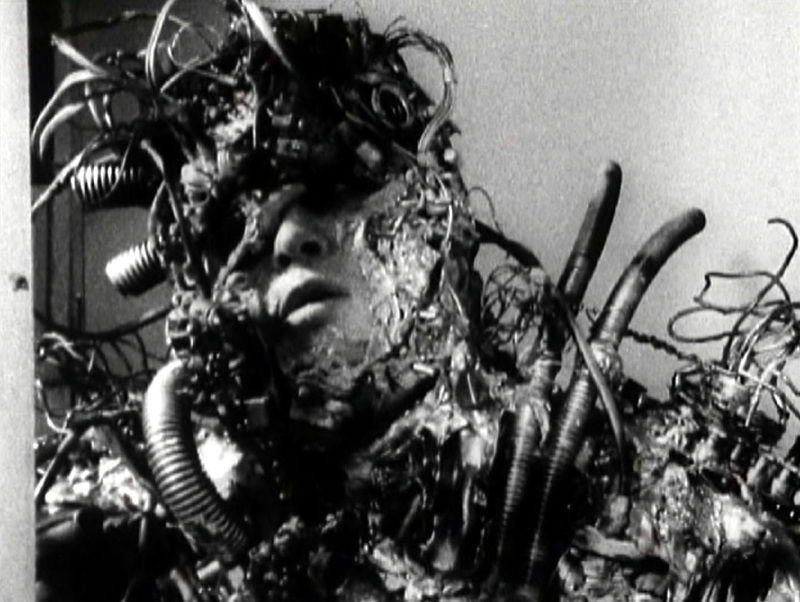 TETSUO: THE IRON MAN (1989) is meant to be a modern cult classic, but am not a fan. I do admire the inventive production however, the grotesque make-up effects are impressive; and when the opening involves one lead cutting his own leg open to insert a metal bar, you feel it. Well, feel squeamish at least. The man we come to know as the Fetishist has photos of track athletes pinned up. He wants to be fast it appears. No gym nearby? Grungily shot in black and white, writer-director Shin'ya Tsukamoto has created a manic body horror sci-fi. Props have to go for getting such mentalness up on the screen, but begrudgingly, as he’s squandered technical skill on a lacklustre story. The first part of a trilogy, which includes TETSUO II: BODY HAMMER and TETSUO: THE BULLET MAN, begins with said Fetishist being hit by a car; the driver behind the wheel, the Salaryman. It seems like that is what happens. The storytelling is convoluted and choppy, not making it easy to follow proceedings. The Salaryman then slowly starts to turn into a cyborg; skin, flesh and body parts transmogrifying unpleasantly. This is interspersed with the Fetishist fixed on a TV channel, linked to a sort of physically impossible CCTV. A woman he watches turns into a cyborg and hunts the Salaryman. They fight. He vanquishes. Later he turns homicidal towards his girlfriend. Other stuff happens, like a cat melding with metal. The usual shizzle you see everyday. If someone caught a glimpse of me while I sat before TETSUO, they would probably have seen a perplexed expression across my face. The production is stylish in places, and energetic – stop-motion, speeded up footage, time lapse, fast edits (in a good way), etc. But these kinetic bursts are wedded to a tedious and repetitive plot, dialled up to 10 on the hectic scale. I guess if you merged with various magnetisable objects, voluntarily or not, you’d be hysterical too. Though this level of hyperactivity not necessarily makes for a compelling watch.